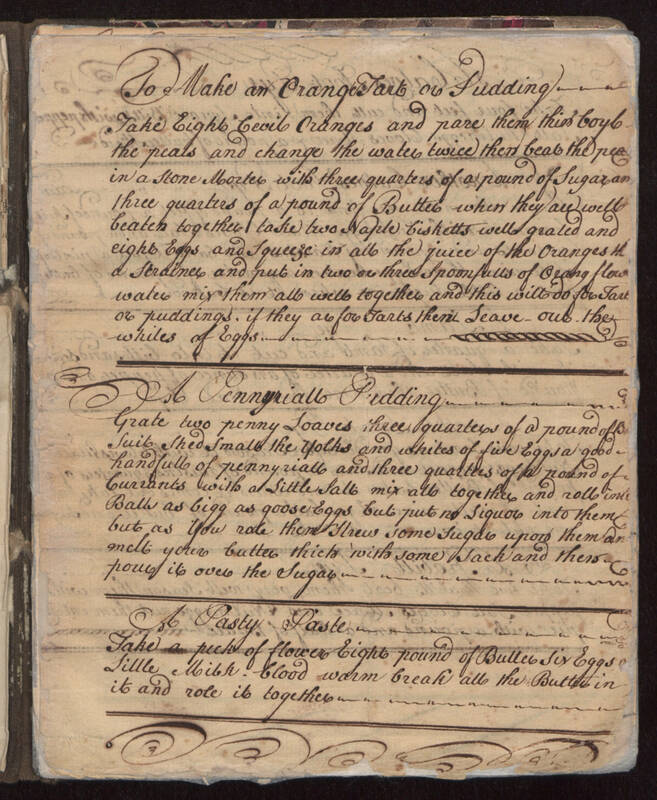 To Make an Orange Tart or Pudding Take eight Cevil oranges and pare them thin boyle the peals and change the water twice then beat the peals in a Stone Morter with three quarters of a pound of Sugar and three quarters of a pound of Butter when they are well beaten together take two Naple bisketts well grated and eight Eggs and Squeeze in all the juice of the the Oranges in a Strainer and put in two or three spoonfulls of Orange flower water mix them all well together and this will do for Tart or puddings. if they are for Tarts then leave out the whites of eggs. A Pennyriall Pudding Grate two penny Loaves three quarters of a pound of Beef Suit shed small the yolks and whites of five Eggs a good handfull of pennyriall and three quarters of a pound of Currants with a little salt mix all together and roll into balls as bigg as goose Eggs but put no Liquor into them but as you role them Strew some sugar upon them and melt your butter thick with some Jack and then pour it over the sugar. A Pasty Paste Take a peck of flower Eight pound of Butter six Eggs little milk blood warm break all the Butter in it and role it together.